Glen Springs Pool, facing northwest. 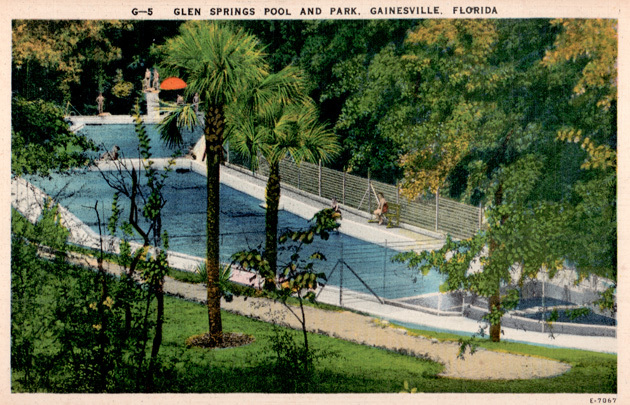 For nearly 90 years, man has controlled nature at Gainesville’s Glen Springs Pool–and man is faring surprisingly well. 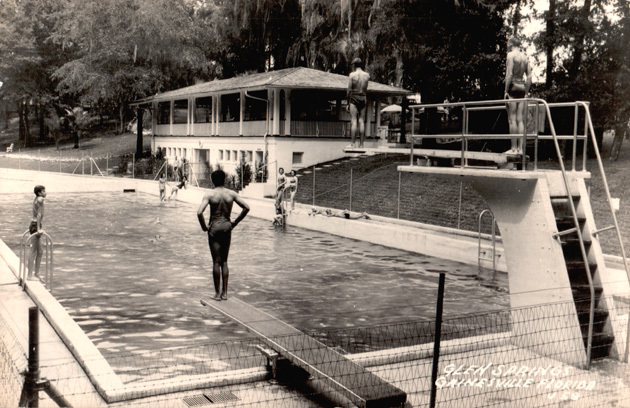 The pool was built in the late 1920s and expanded in the 1940s by Guy Chandler Fulton, best known for his post-World War II works on the nearby University of Florida campus. Glen Spring was a popular recreational spot, hosting a range of events at the pool and inside the spring house, which was also designed by Fulton. The spring may have even hosted a “mermaid” show. Postcard from an unknown date. Courtesy University of Florida Digital Collections. 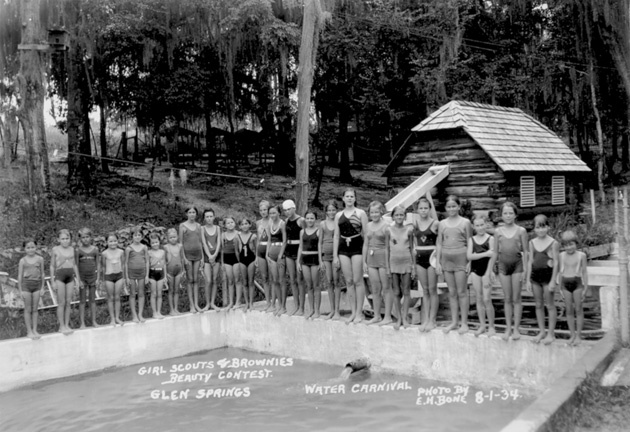 Girls Scouts and Brownies pose in 1934. Courtesy University of Florida Digital Collections. Circa 1940 car dealership promotion. Courtesy University of Florida Digital Collections. Notice the spring house in this 1959 postcard. Courtesy University of Florida Digital Collections. 1961 view. Courtesy University of Florida Digital Collections. 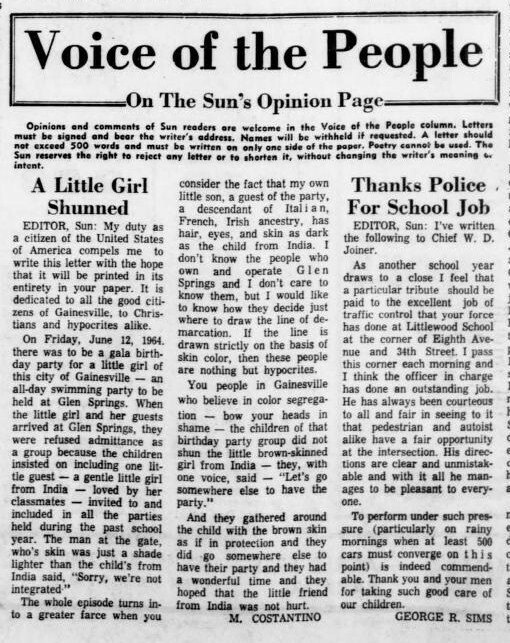 This 1964 Gainesville Sun letter to the editor shows that not everyone was welcome at the pool during Segregation. Courtesy University of Florida Digital Collections. Ad in the summer 1947 edition of the Florida Alligator. Courtesy University of Florida Digital Collections. Ad in April 2, 1948, edition of the Florida Alligator. Courtesy University of Florida Digital Collections. 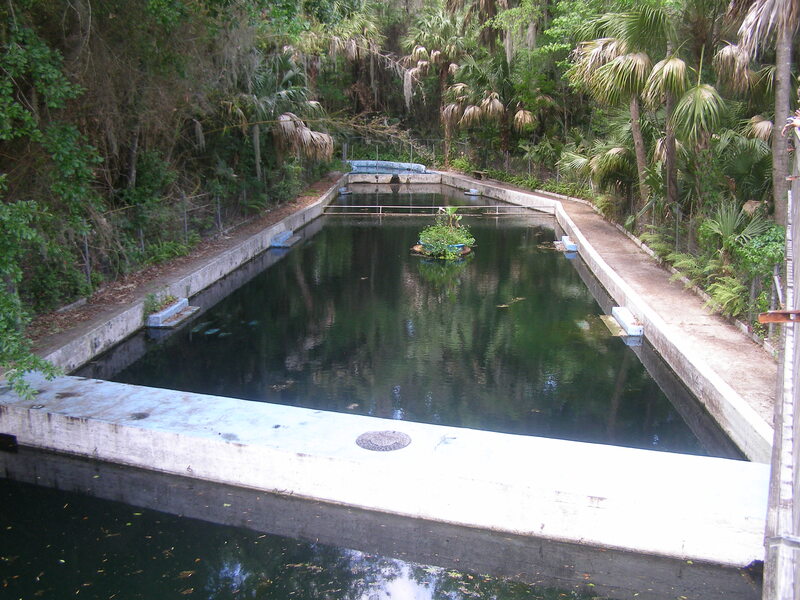 The pool closed to swimmers in 1970 after Gainesville banned the dumping of chlorinated water into its waterways. It has not been maintained since. The Elks Club now owns the property, and the pool serves as a fish pond that is occasionally raided by otters. I discovered the pool via a posting on the blog Visual Ephemera. Its existence surprised me, because I have driven past the site, at 2424 NW 23rd Blvd., many times but never knew what was tucked behind the club’s nondescript buildings. Elks member Linda Califf wrote in the entry‘s comments that she is heading an initiative to clean and restore the pool and offers tours. 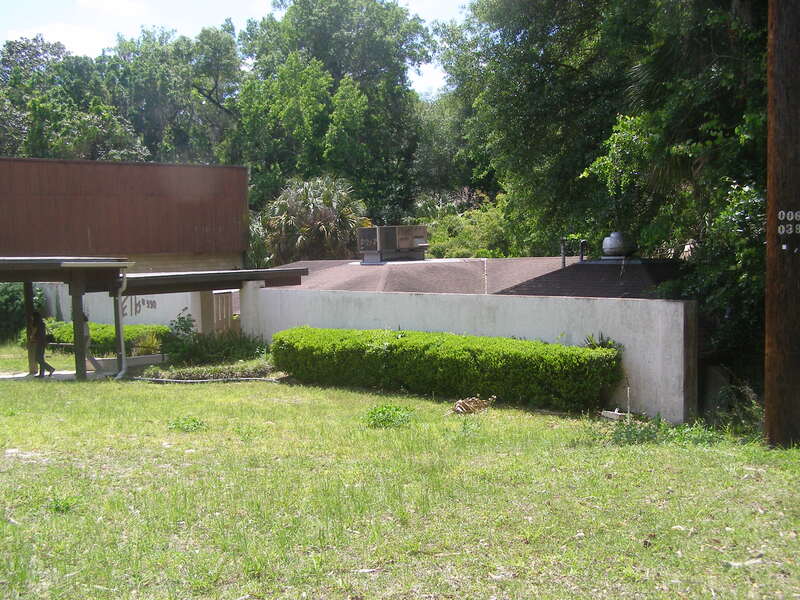 (The property is fenced and only accessible through the Elks-owned spring house.) I contacted her and arranged a tour for April 7, 2012. The Springs House, right, facing west from near NW 23rd Avenue. The main Gainesville Elks Club lodge building is partially visible to the left. The concrete pool is actually three pools. 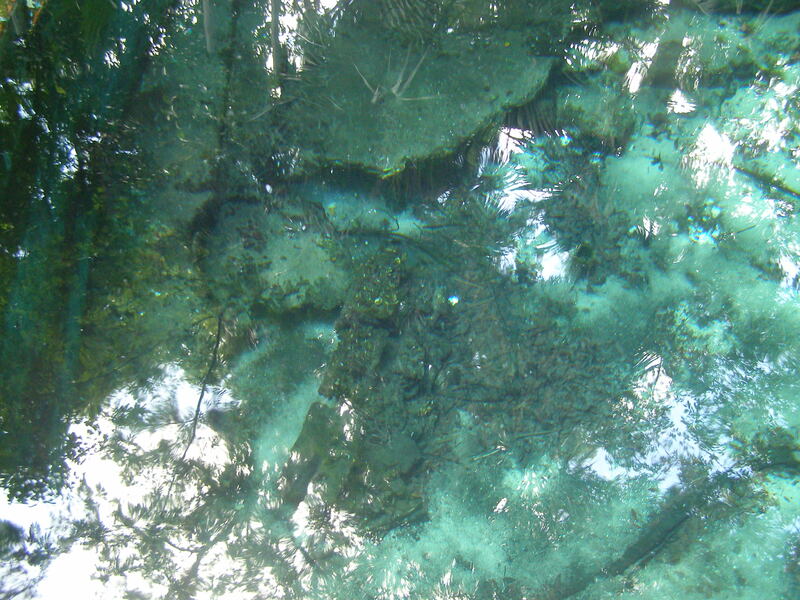 The head pool, where the fifth-magnitude spring bubbles out of the ground, is 18-by-10 feet and perhaps 8 feet deep. The water then enters into a middle pool that makes an approximately 160-degree turn and measures about 170-by-25 feet and 3 feet deep. Next, it trickles into the southernmost pool, which is about 140-by-25 feet and 8 feet deep. Finally, the water exits underneath the diving board and flows down the 500-foot Glen Spring Run before it reaches Hogtown Creek in Ring Park. Trees tower over the pool, the perimeter of which is lined by a chain-link fence. Multifamily residences look down on the site, just 50 feet to the west. Where the spring rises from the earth. The middle pool and spring head pool, facing northwest. The middle pool, facing northwest. Middle pool and spring house, facing southeast. The southernmost pool, facing south. The water exits at this end. 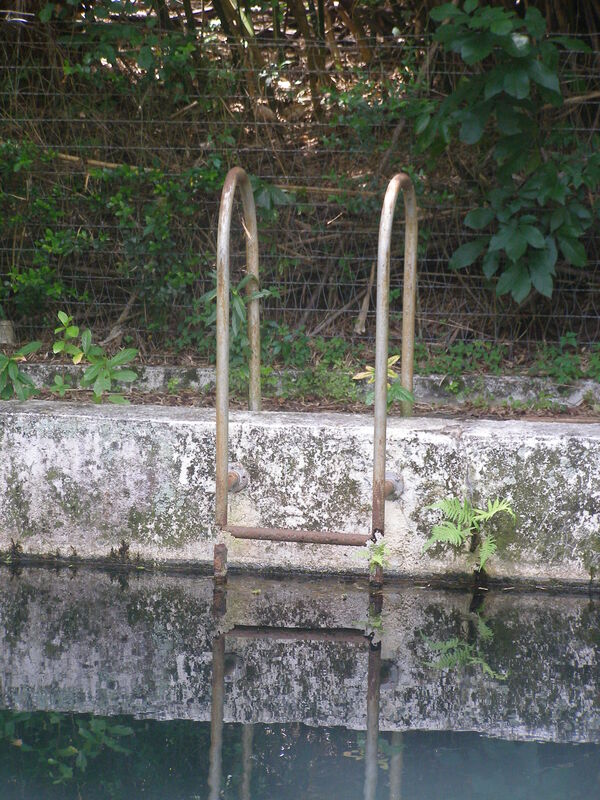 When I saw the pool firsthand, I was surprised at its condition. 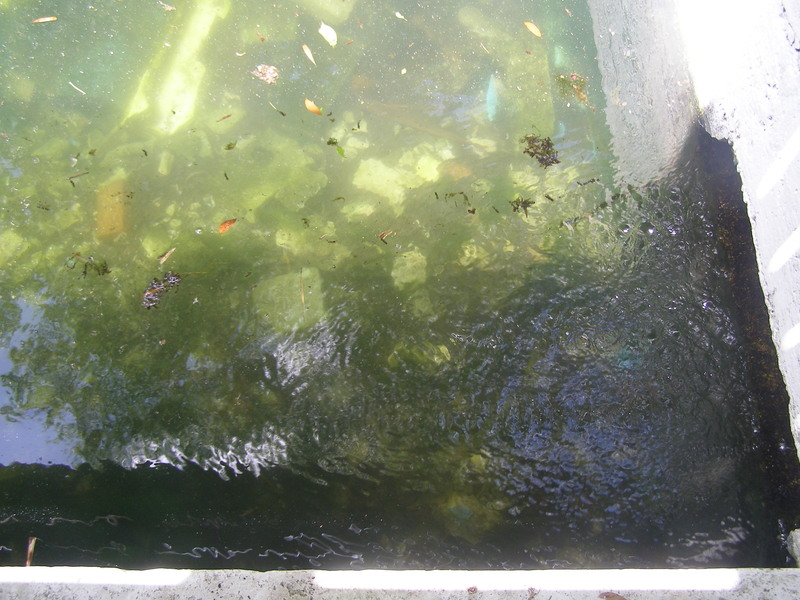 It resembled a crumbling pit in photos, but only the deepest pool, which is full of debris, was opaque. Algae and leaves are most responsible for the water’s unsightly appearance, and those can be removed. The concrete appears to be repairable–amazing considering the lack of maintenance over the past 40 years and perpetually wet surroundings. 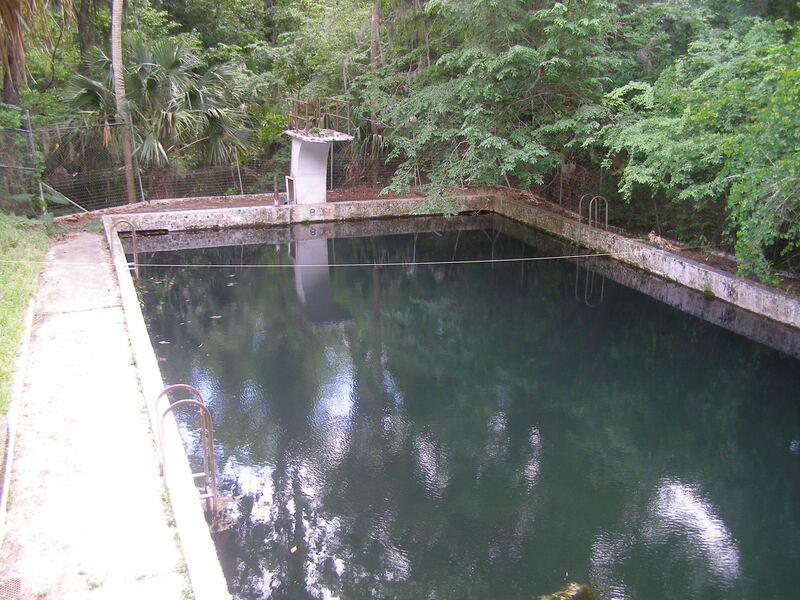 The only major area of concern is the southernmost end near the diving board, where the pool is at risk of collapse because of erosion. Califf gave a comprehensive history of the pool and explained the brilliant drainage system designed by Fulton. She noted that the pool was emptied every Sunday, when lifeguards scrubbed the walls with push brooms. A bar once stood in the middle of this space. Next, she gave a tour of the two-story spring house, used mostly for storage by the Elks who own a larger building next door. 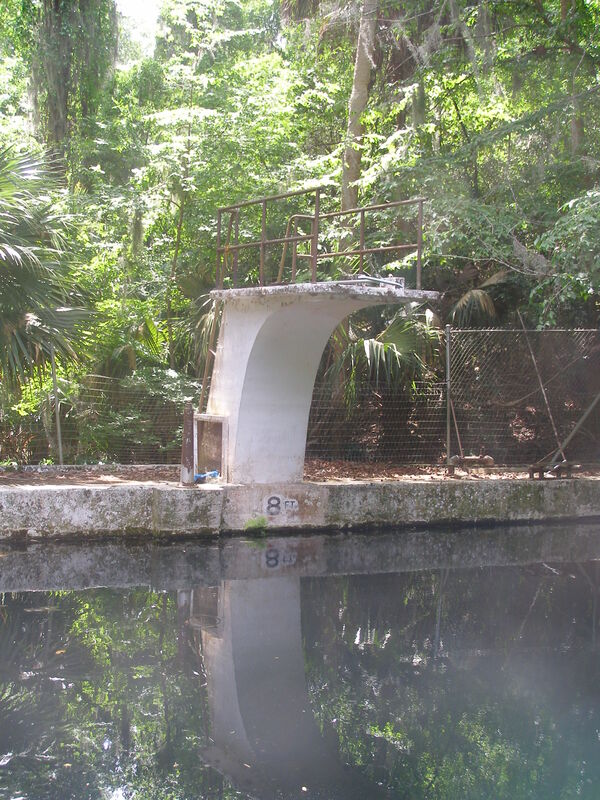 It’s difficult to imagine the spring house as a center of activity as described in the 2003 Gainesville Magazine article “Ghosts of Glen Springs.” The lower level changing rooms are now dank storage spaces, and the windows that looked out to the pool were long ago blocked in. The room that hosted so many dances appears tiny and stuffy, and only the outline of a bar on the maple floor remains in the main room. Water exits the head pool and enters the middle pool. 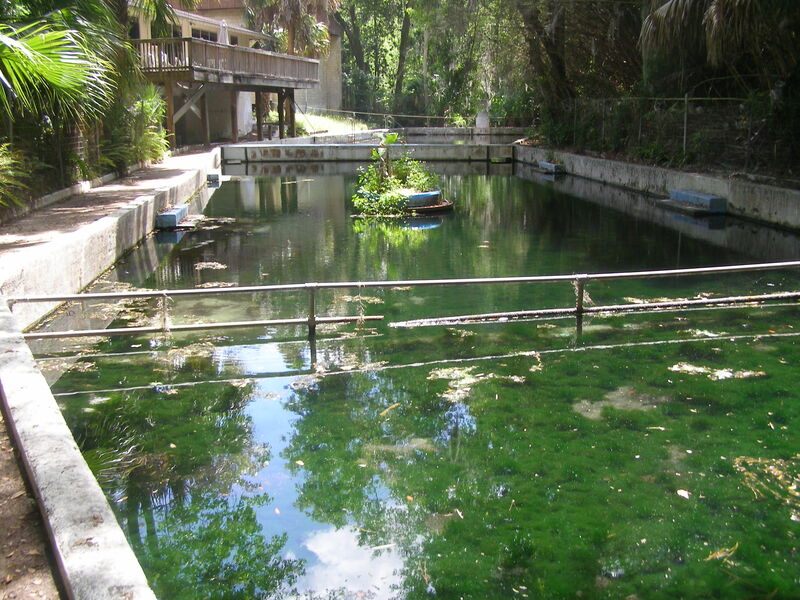 In 2010, Amy Grossman wrote a Glen Spring restoration plan for a UF graduate level class. She called for the spring house to be renovated so the general public–not just the Elks–can once again enjoy the location. I agree with her on that point. However, she also called for the spring run to be restored to its natural state. I disagree. 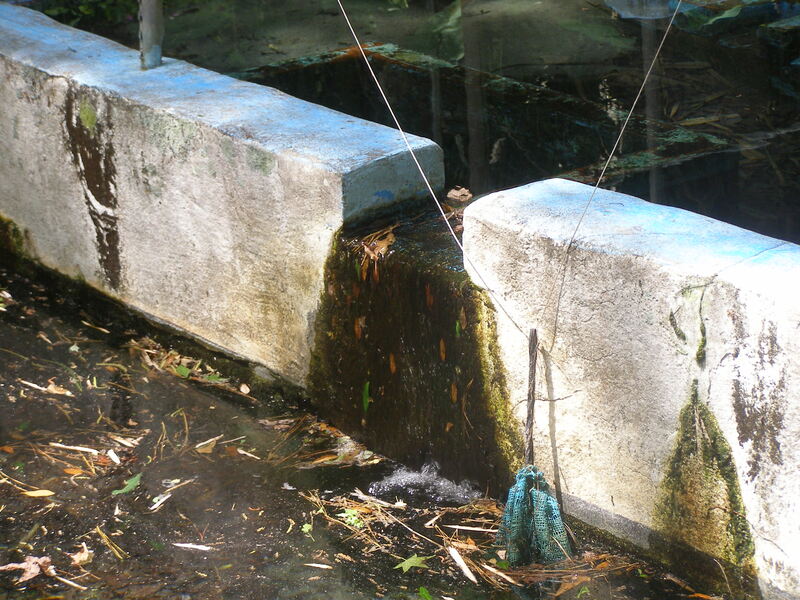 While the pool impedes the spring run’s natural path and volume, it does not disrupt the spring itself. Furthermore, the pool is historic on multiple counts, significant for its engineering, recreational past, and association with Fulton. Water enters the southernmost pool. Note the construction debris on the bottom. But, most importantly, the pool is still capable of functioning in its intended capacity. A pool can be built anywhere, but few places have the opportunity to reopen a historic, spring-fed one. (Think Austin’s beloved Barton Springs.) 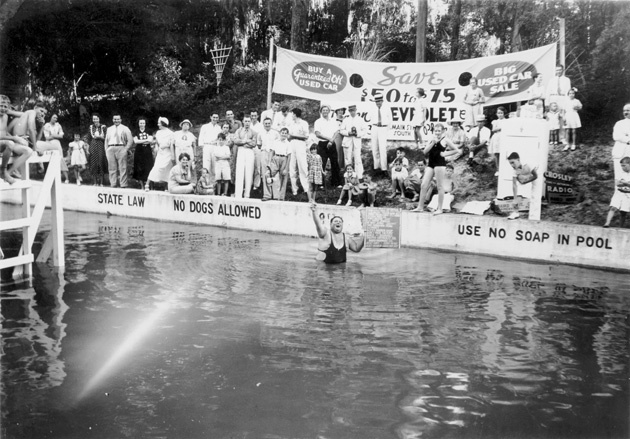 In a region so synonymous with springs, a spring-fed pool in Gainesville would be a celebrated attraction. Whether or not the water flowing out of Glen Spring is safe for swimming is unknown, and the water exiting the pool may have to be filtered before entering the city’s creek system. Fortunately, water treatments have improved since 1970 and may be implemented. But, if the levels are OK, why even treat the water? 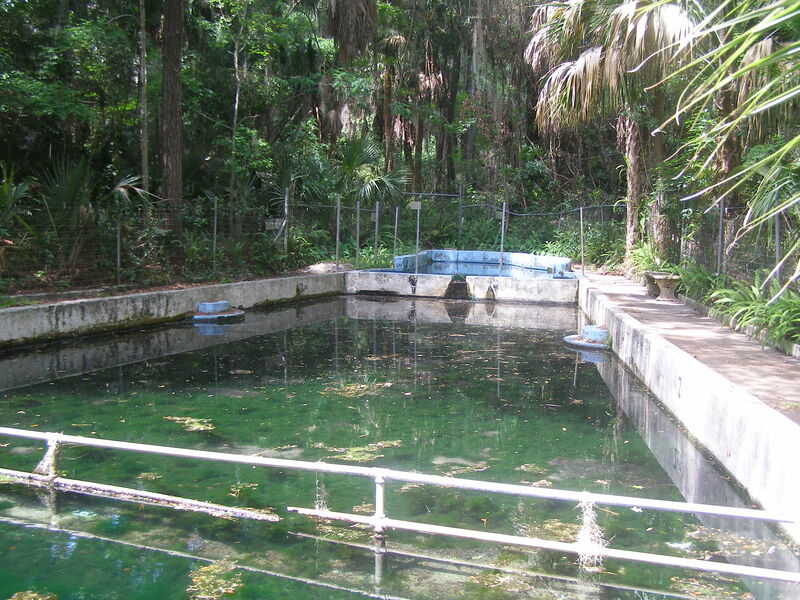 Green Cove Springs, 50 miles to the northeast of Gainesville, has a spring-fed public pool, and it’s not treated. Gainesville’s regulations can always be revised. Of course, returning the Glen Springs Pool to active use requires money–something the Elks do not have. 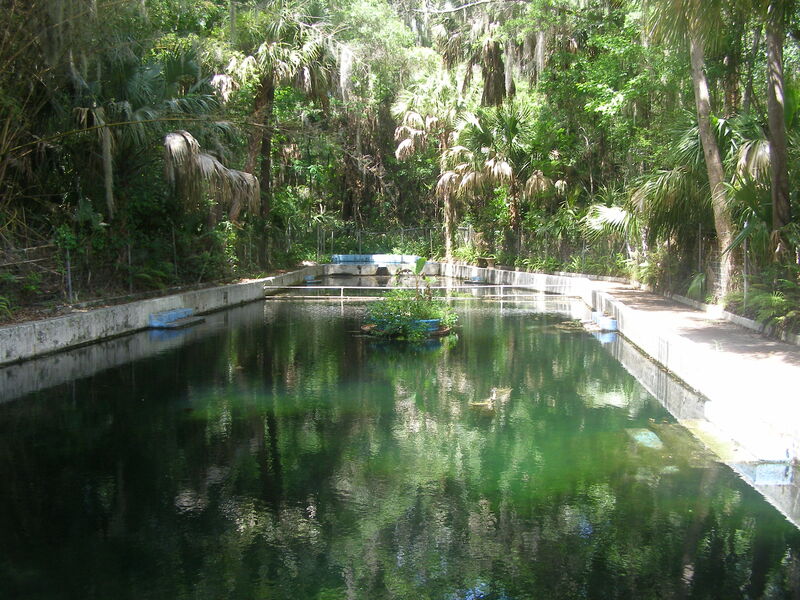 If they do decide to restore the pool, listing the site on the National Register of Historic Places should be the first step. NRHP listing will provide non-refutable proof that the site is historically important and thus worth saving. The listing will also attract attention to the site and open up potential funding opportunities from preservation organizations. At the same time, NRHP listing will not prevent alterations to the pool or spring house, should that building be listed. Also, government entities and many organizations won’t fund projects that are not available to the public. Therefore, it may be wise for the Elks at some point to sell, donate, or lease the pool to the city, county, or nonprofit that can manage and maintain it. I have taken a personal interest in the spring and hope to play a role in its preservation. 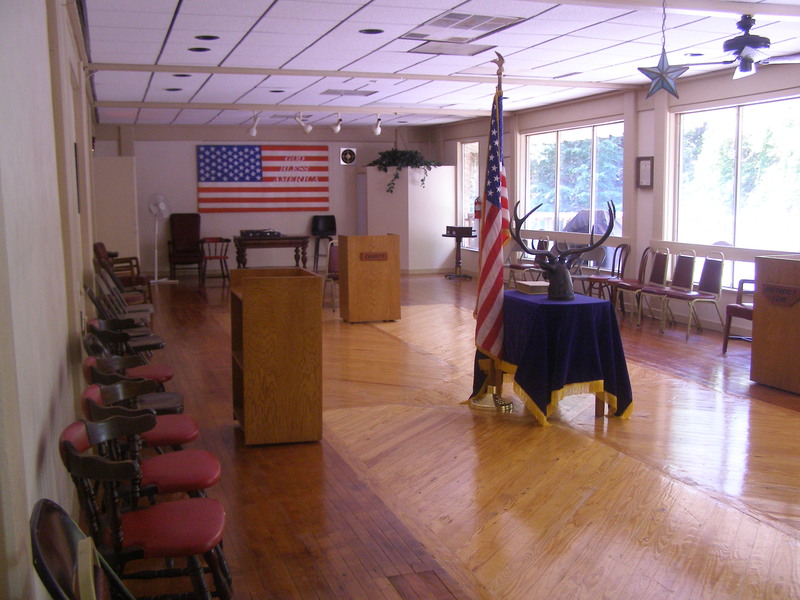 Should the Elks support us, a friend and I would like to write the National Register nomination. We also would like to have the site’s archaeological survey updated; one conducted 30 years ago found evidence of American Indians, but it’s unlikely the spring will be NRHP eligible for that association. Those interested in tours and volunteering for upcoming pool cleanups should contact Linda Califf at lindacaliff@att.net. Awesome post! I agree with you on preserving the pool. I know Amy is still working on a proposal, I’m not sure if her opinion of preserving the pool has changed or not. To me it is a significant cultural resource. I think it would be an obvious site for the Historic Register, should the Elks be willing to go that route. Thank you so much for this info. 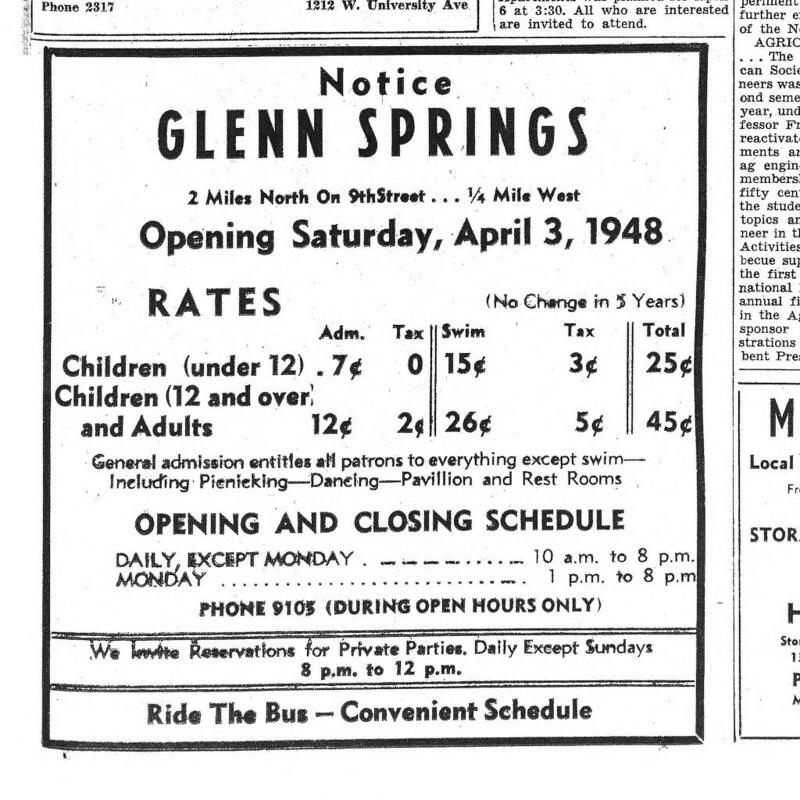 I first went swimming at Glen Springs in 1959 when it was open to the public & was sad to see it close as were many of my friends. I have fond memories of time spent there not only swimming, but going to dances, listening to music & bands, & picnicing with friends & family. For years I have driven by Glen Springs & have always wanted to see what it looks like now as have many of my friends. Not being Elk members, for years many of us old Gainesvillians haved longed to see our old favorite place now hidden from our public view. Thank you so much for posting these pictures. Even though the spring, pools, & property don’t look pristine like I remember them, it is nice to finally be able to see our old spring once again. Now, instead of just imagining what it looks like behind the building down the hill, we can actually know what Glen Springs looks like in its current state. I hope someday the conditions can improve & I hope the otters are having fun. Thanks again for the photos. They will mean a lot to many folks. Thanks for this. My mother, Lucille Cairns George, went there as a little girl in the 20’s. I went there in the late 50’s. I didn’t know it was still there. Our family swam in Glen Spring in 1947 when we lived on Jackson Ave. down from the spring . It would be nice if it could be used again for it’s intended purpose . 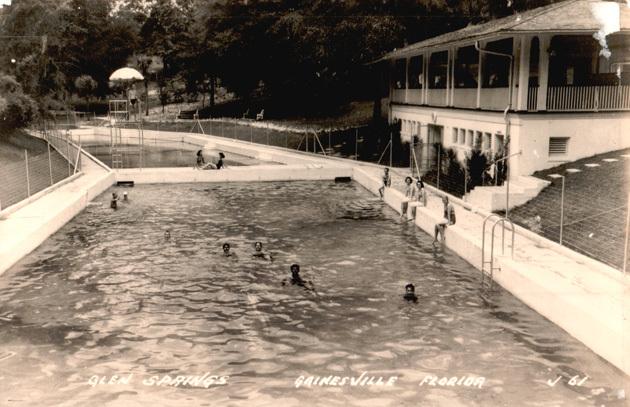 I remember learning to swim at Glen Springs in the 1950s and finally having the courage to jump off the high (to me) diving platform. 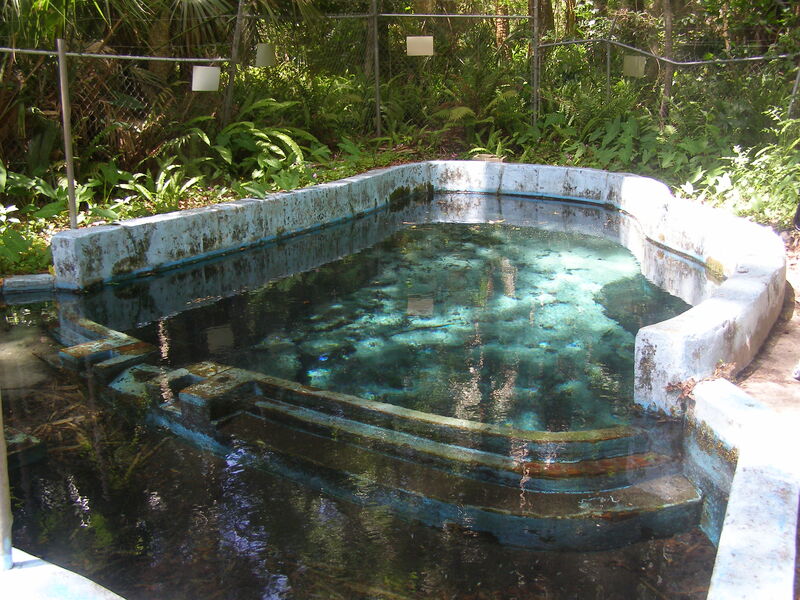 I left Gainesville after college in the 1960s and was sad to hear the pools were closed a few years later. Many happy memories as a kid of swimming in those pools. I hope it can be restored.